‘The Elixir of life’ and ‘Mother medicine of Nature’ are the most popular historical references of Basil for its enormous healing values to the mind, body and soul. It has marked its presence significantly in various medicinal systems in the world including Ayurveda and Homeopathy for treating diabetes, renal colic, epileptic attacks, painful breasts, congestion, asthmatic attacks, diarrhea, numbness, migraine, nervous exhaustion and insomnia. Scientifically known as Ocimum canum, Basil is a member of the mint family Lamiaceae. This traditional medicinal herb is widely distributed in India, especially Tamil Nadu and is called as Nai Tulasi in Tamil. Besides numerous therapeutic properties, the most noteworthy remedial effects of Basil and its essential oil are its functions as a cancer chemoprotective agent and anti-diabetic agent for reducing blood glucose levels in type 2 diabetes. Basil is said to have its origin in India, the land of rich traditional values. The healing, culinary and aromatic attributes of this sweet-smelling plant have been talked about in many classical herbal writings including Charaka Samhita (ancient Ayurvedic text) and the works of renowned herbalists like Dioscorides, Gerard, Culpeper and Parkinson. Parkinson has quoted that Basil’s scent “fit for a King’s house”, denoting its royal aroma and has also said that Basil can be used “to procure a cheerful and merry heart.” Gerard and Culpeper has mentioned that Basil is an excellent remedy for melancholy and is a natural antidote for insect bites including scorpion stings, mosquito bites and bee stings. The word ‘Ocimum’ (generic name) is derived from the Greek word ‘okimon’, which means smell. This indicates one among those reasons behind the unforgettable fragrance of the Basil variety. Basil plays a vital role in various religious practices across the world, where it has been considered as a sacred herb in Hinduism and said to have grown at the place of Christ’s crucifixion. Basil plant has also been associated as a symbol of love, protection, courtship, truthfulness, courtship, death and luck. This plant has been a significant part of various religious ceremonies, where the smoke from burning this herb is said to calm the mind and augment the spiritual power. Ocimum canum has been used in the traditional medicine for treating oral problems, fever, insect bites, constipation, parasitic infestations, cold, inflammation, headache, joint pain and dysentery. This plant was burnt in the homes as incense and for protecting from insects. Basil leaves were also used to guard the crops post harvesting from the damages of insects. This herb is much remembered in various traditions across the world in the treatment of type 2 diabetes. Basil and its essential oil are also used as a flavoring agent in soft drinks, shampoos, cuisines, body lotions, teas, candies, dairy products, toothpastes and cosmetics. The essential oil of Basil has about 36 chemical components and is a rich source of camphor, eugenol, β-caryophyllene, a-pinene, limonene, myrcene, camphene, naphthalene, caryophyllene and valencene. These components contribute to its therapeutic properties like antiemetic, anti-stress, antiviral, antibacterial, rubefacient, antidiabetic, antiasthmatic, antimicrobial, anticancer, insecticide, anti-fertility, anti-fungal, anti-malarial, antioxidant, expectorant, analgesic, antispasmodic, anti-inflammatory and antiseptic. Ayurveda is a complete medicinal practice which stands on the three pillars of health, including physical, mental and a hearty soul. For attaining this holistic healing, Ayurveda focuses on treating the root cause of an illness instead of treating the symptoms. This aids in curing the sickness initially and preventing it in the future as well. The principle of Ayurveda strongly believes that every individual is a unique part of nature with a unique individual constitution, which consists of three dynamic energies called as doshas. They are vata, pitta and kapha. These doshas are a representation of the five fundamentals elements of nature. They are water, fire, earth, space and air. Vata dosha is an arrangement of air and space and is in charge for circulatory, respiratory, and nervous functions of the system. Pitta energy is a combination of fire and water and it takes care of body temperature and metabolic activities including digestion, absorption and elimination. Kapha is a representation of earth and water and is responsible for reproductive functions, movement of fluids and muscular development of the body. Ayurvedic texts state that every person should be treated in a unique manner according to the predominance and balance between the 3 doshas. This doshic structure determines a human’s physique, character and behavioral attributes. Imbalance between these doshas is said to happen based on an individual’s balance with nature, which is said to deviate depending on a person’s change in food habits, lifestyle changes, environmental factors and climatic conditions. Doshic imbalances lead to illnesses and is best treated in Ayurvedic medicine by recommending natural remedies including herbs, essential oils, meditation, yoga, prayers, Pranayama or the art of balanced breathing, simple physical exercises, Abhyanga (Ayurvedic massaging), Ayurvedic routine, Panchakarma (Ayurvedic detoxification) techniques. These remedies help in correcting the imbalance between these doshas and aid in healing the illness initially and preventing it in the future as well. Basil oil is said to reduce kapha dosha predominantly, pacify vata and enhance pitta dosha with its warming effect on the system. Abhyanga or the art of Ayurvedic massaging is an ancient healing technique and is one among the friendliest remedy for treating various medical conditions. Massaging in Ayurveda means the use of palms, elbows, feet and other conventional massaging tools and equipments for maneuvering nerves, muscles and the whole body. Ayurveda prescribes the use of Ayurvedic essential oils in massaging technique after analyzing the individual constitution and the state of health. By this way, the medicinal properties of the essential oils pass on to the blood stream and then to the skin, where it transforms the respective health benefits to the related parts of the system. The largest organ of the human body is skin. Using Ayurvedic essential oils in topical application, aids in passing on the healing values to the system by penetrating through the skin cells. This traditional massaging technique helps in enhancing the blood circulation and augments the red blood cells count. Massaging your system with 10 drops of Basil oil blended with 5 drops of Clove oil, 5 drops of Lavender oil and 5 drops of Lime oil along with 15 ml of coconut oil can assist in treating respiratory infections, skin problems, diabetes, high levels of cholesterol, headache, arthritis, rheumatism, dandruff, kidney stones, urinary infections and digestive disorders like indigestion, heartburn, vomiting and other stomach disorders. Basil essential oil has detoxifying, diuretic, antioxidant and analgesic properties that help in discarding toxic remains from the system by promoting frequent urination. This also aids in reducing the level of uric acid and salt deposits, which may otherwise lead to the formation of kidney stones. Improper blood circulation, stagnation of water deposits and amassing of toxic remains or ama (left due to indigestion) are the major causes for rheumatic conditions, arthritis and pain leading to stiff joints, inflammation, painful muscles, soreness, redness, irritation, fatigue and difficulties in performing routine tasks. Gently massaging the painful and affected parts with this Ayurvedic massaging blend can be of great assistance in reducing inflammation, redness, irritation, pain and it also supports in promoting blood circulation in the painful areas. The therapeutic values of Basil oil along with other Ayurvedic oils in this massage blend promotes the frequency and quality of urination through which the toxic remains in the system are eliminated. Homeopathy medication prescribes the use of Ocimum canum in the treatment of diseases associated with the kidneys, urethra and bladder. The most common health disorders treated with Basil in Homeopathic medicine are cramps and pain in kidneys and ureters, urinary problems like formation of high acidity or spike crystals of uric acid, renal colic, swelling and other symptoms of renal calculus. The essential oil of Basil has antimicrobial, antifungal, antiseptic and antiviral properties that help in healing numerous skin disorders including acne and dermatitis. 3 drops of Basil oil blended with 3 drops of Lavender oil and 3 ml of coconut oil can be applied on acne, marks, ringworm, eczema, athletes’ foot, leucoderma, itches and insect bites for improved results. Basil oil also helps in clearing away skin blemishes and marks left behind by acne and wounds. Fresh juice extracted from Basil leaves mixed with honey is a traditional remedy for treating acne in Ayurveda. With its antifungal properties, Basil oil is said to be an excellent remedy for clearing dandruff, hair fall, dry and itchy scalp conditions. A 2012 study on Antifungal activity of Ocimum canum Essential oil against Toxinogenic Fungi isolated from Peanut Seeds in post-harvest in Benin, published in the International Research Journal of Biological Sciences, concluded that the essential oil of Basil is used as an antifungal agent in protecting peanuts post harvest in Benin against the toxic strains of fungi like Aspergillus parasiticus and Aspergillus flavus. Slightly heat 5 drops of Basil oil with 5 drops of Rosemary oil, 3 drops of Ylang Ylang oil and 3 drops of Lemon oil along with 10 ml of sesame oil and massage it soothingly on your scalp. Leave this blend to rest on your scalp for 30 minutes. Wash your hair with a mild shampoo blended with 1 drop of Basil oil and 1 drop of Lavender oil for treating dandruff, rough hair and split ends. This also aids in controlling hair fall and supports shiny, lustrous and thick hair. Just like Clove oil, Basil oil is also a rich source of eugenol, caryophyllene and methyl eugenol. The high level of antioxidants along with these chemical constituents helps in supporting the proper functions of the pancreatic beta cells. These cells are responsible for storing and releasing of insulin in the system. Massaging your system with this medicated blend will be a great aid in increasing the sensitivity to insulin and can help in controlling the level of blood sugar and insulin. This also helps in treating oxidative cellular stress and damage, thereby reducing the increased level of cholesterol and high blood pressure. You can also add 1 drop of Basil oil and 1 drop of Clove oil in your bathing water daily for obtaining these benefits. A 2002 study on “Extract of Ocimum canum lowers blood glucose and facilitates insulin release by isolated pancreatic beta-islet cells” by Nyarko AK, Asare-Anane H, Ofosuhene M, Addy ME, Noguchi Memorial Institute for Medical Research, University of Ghana, Legon studied the use of the aqueous extract of Ocimum canum in the traditional Ghanaian medicine for treating diabetes mellitus. 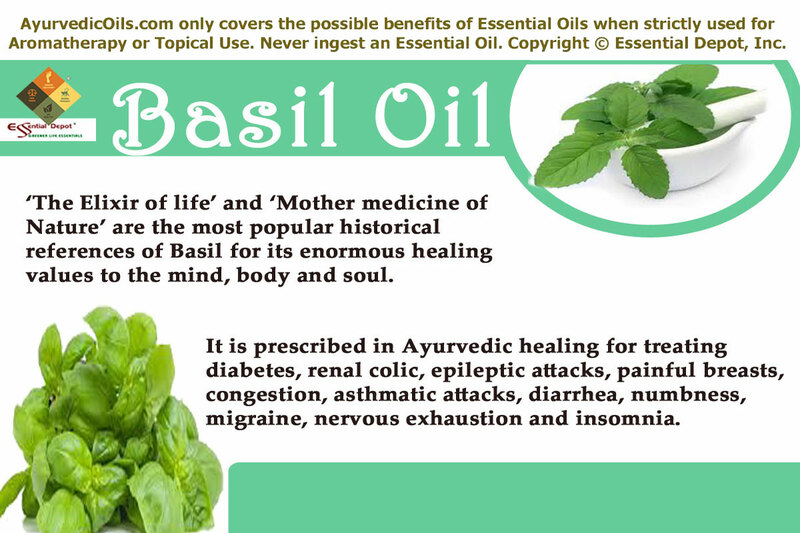 Basil oil is a known Ayurvedic remedy for treating fever, including viral and malarial fever. With its febrifuge, antibacterial, antifungal, insecticide and antimicrobial properties, Basil and its essential oil assists in reducing the body temperature even in cases of high fever. Massaging your foot soles with 2 drops of Basil oil along with 2 drops of Coriander oil and 2 ml of coconut oil can help in reducing fever significantly as all the nerves in body end up in foot soles and passing the therapeutic properties of these essential oils through the foot soles grants instant relief. Basil essential oil has been proven for its remedial effects in reducing excess of kapha dosha, which is responsible for respiratory infections including flu, common cold, nasal congestion, sinusitis, bronchitis, chest congestion, whooping cough and breathing difficulties. Adding 2 drops of Basil oil and 1 drop of Eucalyptus oil in steam inhalation can help in relieving cold, cough, nasal congestion, sinusitis, sore throat, watery eyes and difficulties in breathing due to excess of mucus and phlegm deposits in the nasal and bronchial passages. Aroma plays a significant role in the natural healing methodologies and is one among the five types of remedial measures in Ayurveda. The sense of smell in Ayurveda states that an encouraging, energizing and tranquilizing fragrance has a positive effect on the entire system. This is the major reason for the use of incense sticks, flowers and aromatic candles during prayers and other spiritual gatherings. Basil essential oil owns a warm, sweet, herbaceous and invigorating aroma that implants an encouraging effect on the plasma, nervous system and the circulatory system. When inhaled the therapeutic properties of this oil reach the limbic system of the brain through the nasal passages. Limbic system is the control center of the human brain that controls the feelings, emotions and attributes of a person. 2 drops of Basil oil with 1 drop of Neroli oil and 1 drop of Clary Sage oil added to the burner, diffuser, aromatic candle or vaporizer during meditation or Pranayama can assist in treating anxiety, mood fluctuations, stress, fatigue, nervous weaknesses and stressful conditions. This also assists in enhancing memory power, concentration, sexual interest, self-confidence and spiritual oneness. Being a sacred oil, Basil is known for its power in uplifting the spirit and supporting improved spiritual bonding. This also helps in expanding the heart chakra, which is responsible for self-confidence, self-love, self-respect and love for others. Inhaling the curative aroma of this oil is said to generate a soothing effect on the intestines and stomach and alleviates spasms and cramps. Basil essential oil has antimicrobial and antibacterial properties that work as a protective shield against germs causing tooth decay, bad odor and gum problems.1 drop of Basil oil and 1 drop of Clove oil added to a cup of warm water can be used as an oral rinse for relieving plaque, tooth pain, bad breath and protecting from damaging germs and other micro-organisms. This gargle can also aid in strengthening the gums and lessening toothache due to sensitivity. 2 drops of Basil oil blended with 2 drops of Eucalyptus oil and 2 drops of Bergamot oil in warm or cold compress aids in relieving joint pain, headache, muscular spasms, arthritis, stomach ache, rheumatic pain and migraine. Basil and its essential oil is also effective in the treatment of intestinal worms, indigestion, cancer (attributed to its antioxidant and cytotoxic activities), eye irritation, epileptic attacks, renal colic, vomiting, painful kidneys, epileptic convulsions, painful urination and weak immune system. This article is meant only for the use of education and information. It is not in any way recommended for substituting prescription drugs or expert medical guidance. We are not professionals in healthcare and this information is shared purely based on the interest of spreading the fragrance of Ayurvedic healing, the world’s oldest medical system on earth. Never use essential oils internally and make sure that you dilute essential oils before using it for external application. This is because 100 percent organic and pure essential oils are highly concentrated substances and may cause allergic reactions if used on the skin directly. Talk with your Ayurvedic practitioner/ healthcare expert before selecting the most suitable essential oils for your prakriti or unique individual constitution and state of health. Please avoid using Basil oil if you have sensitive skin or during pregnancy. 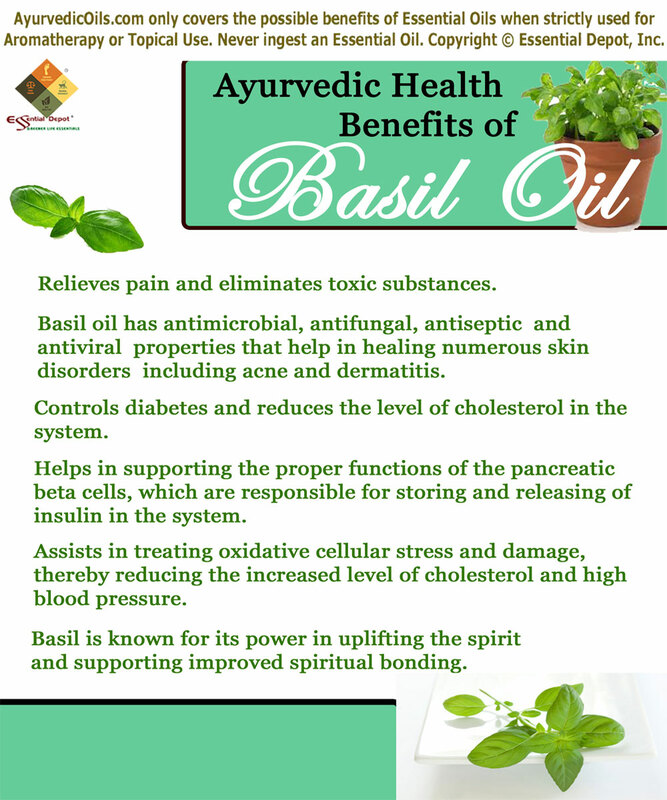 This entry was posted in Essential Oils - Learn About and Purchase and tagged Ayurvedic health benefits of Basil, Ayurvedic oils for acne, Ayurvedic oils for cancer, Ayurvedic oils for dandruff, Ayurvedic oils for de-addiction, Ayurvedic oils for depression, Ayurvedic oils for diabetes, Ayurvedic oils for fever, Ayurvedic oils for hair fall, Ayurvedic oils for headache, Ayurvedic oils for kidney stones, Ayurvedic oils for memory power, Ayurvedic oils for pain, Ayurvedic oils for respiratory infections, Ayurvedic oils for rheumatism, Ayurvedic oils for stress relief, Ayurvedic oils for urinary infections, Ayurvedic remedies for cancer, Chemical constituents of Basil oil, Health benefits of Basil oil, Natural remedies for diabetes, Ocimum canum, Therapeutic properties of Basil oil by AyurvedicOils. Bookmark the permalink.